Notes from an Amateur Luthier. . . I started out easy, in 1987, by building a few small musical instrument kits, such as a dulcimer, a small harp, an autoharp, and a mountain banjo. After discovering that it wasn't as hard as I had envisioned it would be, I finally took the plunge and purchased a Martin D41 dreadnought guitar kit. By my standards today, that first guitar in 1994 was pretty dreadful in its appearance, but its sound was fantastic! And it didn't fall apart or anything. So, I was hooked. Since then, I've built thirteen guitars (and a few other instruments), four for actual paying customers! It is, indeed, an addictive hobby. The main reason I want to keep building them is that I know, with each one, my skills improve. New: An Updated Tools List!!! 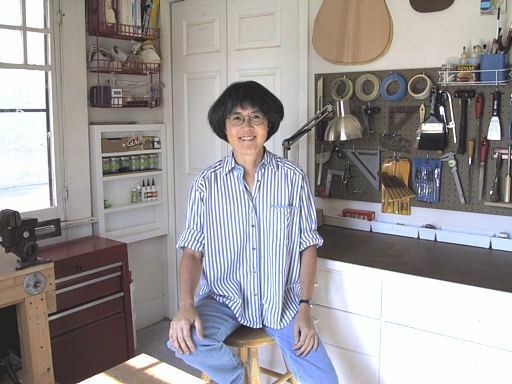 June 2008: Check out this video of my guitarmaking room!!! Video Tour of my Fall 2014 Workroom Remodel!!! IF YOU WOULD LIKE TO SEE PHOTOS OF THE FINAL RESULTS OF MY GUITARMAKING ROOM REMODEL, CHECK IT OUT HERE!!!! And, for an account (originally posted on Facebook) of the actual PROCESS of renovating my workroom, with detailed descriptions, click HERE. A really neat jig for cutting the neck scarf joint on a table saw!!! A jig I made to easily cut the taper on my fingerboards!!! But wait . . . . there's even more!!!! * Summer 1998 : A Dreadnought and my "Weird Classical"
* Summer 2004 : Back to the Dreadnought!!! And a lutherie/vacation trip to the Guild of American Luthiers Convention in Washington. * February 2006 : A Cigar Box Ukulele!!! * Summer 2011 : A Harp Ukulele!!! * Summer 2012 : A Second Harp Ukulele!!! * Winter 2012 : A Weissenborn Guitar!!! * Spring 2013 : Some New Jigs . . .
* June 2013: Another Size 5 Guitar and My Very First French Polish!! * August 2013: A Cajón! In the project accounts that follow, I have often included embedded Facebook posts (it has been easier to post daily to Facebook and then embed those posts on this website). If you want to see the ENTIRE post (especially those with photos and accompanying captions), you will sometimes need to click on the BLUE "SEE MORE" LINK or the BLUE FACEBOOK ICON in the upper right-hand corner of the post. * April - November 2015: Randall's OM Kit Guitar!!! * August - November 2015: Val's Tenor Ukulele!!! * October 2015: A Banjo Ukulele!!! * November 2015 - May 2016: The 2015 Taylor-style Grand Concert Classical!!! The Resurrection of the 2nd Violin Project!!! NEWS FLASH: APRIL 23rd, 2018: I'M BACK!!!! My 2016/2018, "Fully-Loaded" Size 5 Guitar!!! Over the years, I've found some methods of completing a few common instrument-building tasks which have worked for me. However, I've realized that I've been kind of haphazard in describing these methods, when mentioning them in the various accounts of my projects. NEW for Summer 2015 ----- Guitarmaking Room Remodel!!! NEW for Summer 2004 ----- my New Old Shed!!! Here you will find photos of . . . . Some Sad News: Emily, R.I.P. My Trip to Tacoma for the 2004 GAL Convention!!! My Trip to Tacoma for the 2011 GAL Convention!!! My Trip to Tacoma for the 2014 GAL Convention!!! September 22nd, 2012 .....The church I attend asked me to bring some of my latest instruments to its second "Acoustic Café". Here's a video. My 2009 Size 5 Guitar in Action!!!! If you are interested in getting a copy of my website on DVD, so you can read it offline, click HERE for the details! I also have available a bracing plan I made for my Taylor-style Grand Concert Cutaway. If you are interested in that plan, click HERE for the details!